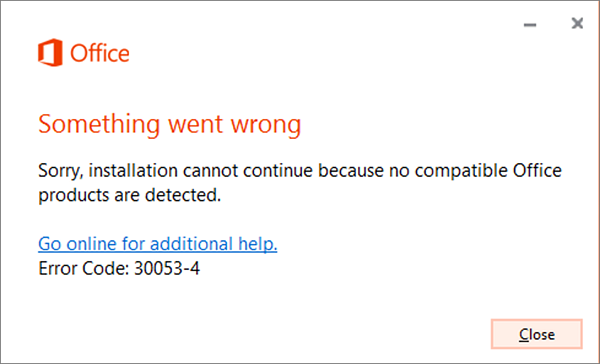 You might see one of these errors if you're trying to install an Office language pack and you don't have the correct version of Office installed. You must install Office before you install a language pack. For Office 365 and Office 2016, 2013, and 2010, see Language Accessory Pack for Office and follow the steps for your version of Office. For volume license versions, see the section below, Install a language pack for a Volume Licensing edition of Microsoft Office 2016. Not sure what version you have? See What version of Office am I using? If you're using a Volume License version of Microsoft Office 2016, you can download an ISO image of the language packs, language interface packs, and proofing tools from the Volume Licensing Service Center (VLSC). Please contact your administrator for more information. For more information about Office 2016 language packs, see Customized language setup and settings for Office 2016.